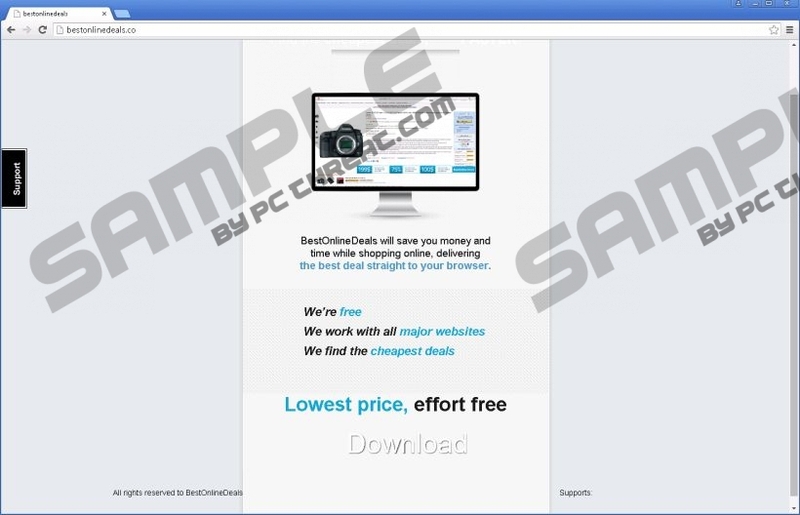 Best Online Deals is an all new adware-type program designed to show you unasked-for third-party ads of questionable reliability. Therefore, we advocate for its removal and we have taken steps to provide you a way to do it. In way, it is a strange program, not because it is adware and has been set to display commercial content, but because it belongs to the so-called Lyrics family. This family of adware used to be promoted as programs that displayed song lyrics while listening to music on Youtube.com. But it seems that their advertising strategy has shifted towards a more straightforward approach. Best Online Deals is advertised as a program that will help you save money by delivering you the best deals. Of course, you probably did not want to install this program in the first place, but it somehow got on your computer anyway. We have received reports from users that this malicious program is distributed via freeware bundles. These software bundles usually consist of one program that acts as the façade and at least one malicious program that is hidden away. Such bundles are usually featured on borderline legitimate websites. However, to avoid legal complaints the owners must give the user the opportunity to expel unwanted programs from the installation wizard. But you must choose Custom over the Express installation settings in order to remove Best Online Deals. We would also like to give a dishonorable mention to SeeWords, Searchbetter, and Look Forword as they are clones of Best Online Deals that were released some time ago. You should not waste your time with Best Online Deals, because it will not save you money while you shop online. It will show you advertisements regardless of whether you are shopping or not. It will not only display ads on online shopping websites, but on non-shopping-related websites as well. And the ads are just super annoying. According to its terms of service, Best Online Deals can display advertisements in the form of banners, pop–ups, pop-unders, coupons, price comparison, in-line text, and display ads. The ads come from third parties and the developer declares that it cannot be held responsible or liable for undesirable consequences that might occur as a result of using this program. No one can deny that Best Online Deals is just an adware program. Claims that it can save you money are only empty promotional promises that you should not pay any attention to. Besides, you probably never even wanted to install this program, since you probably got it by accident after installing a software bundle. Annoying and misleading commercial ads and information collection are things for which Best Online Deals is known for. If you want to remove this program, then consult the instructions featured at the bottom of this article. Find Best Online Deals and right-click on it. Open the Charm bar on the right bottom side of the screen. Click Settings and go to the Control Panel. Find Best Online Deals and Uninstall it. Find Best Online Deals and Remove it. Quick & tested solution for Best Online Deals removal.